Ainu culture at the Ainu Ethnic Museum "Poroto Kotan"
1 What kind of town is Shiraoi? 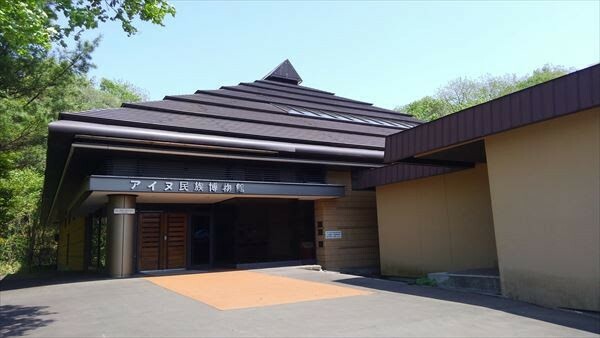 2 What is Ainu Ethnic Museum “Poroto Kotan”? What kind of town is Shiraoi? Ainu Museum Poroto Kotan is located in a town named “Shiraoi”, which is a town situated between Noboribetsu City, famous for its hot springs, and Tomakomai City, one of the leading industrial cities in Hokkaido. 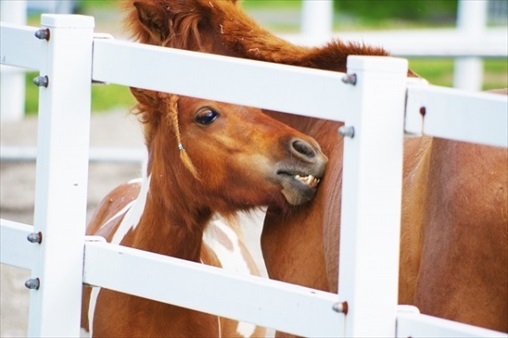 Shiraoi’s main industries are livestock and fishing industries, while its thoroughbred farms have been producing some excellent race horses. 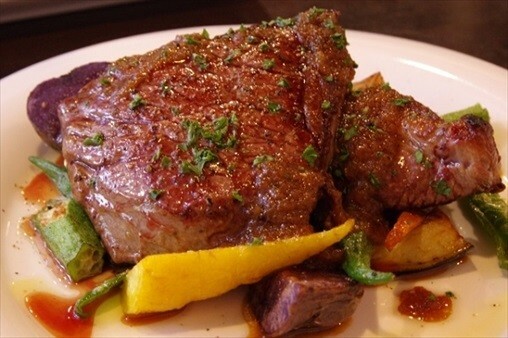 In addition, Shiraoi beef is remarkably popular in Hokkaido. Fans of this meat gather from all over the island to form huge groups at “Shiraoi Beef Festival”. The town is also known for its tasty seafoods, especially cod roe from Kojouhama, which is a remarkably popular item that is shown on Hokkaido’s product exhibition. 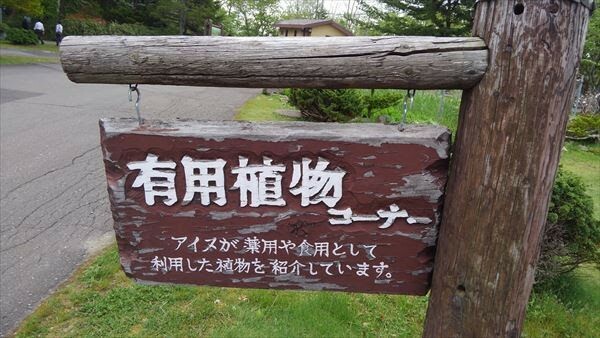 I also recommend visiting Kojouhama hot spring, a hidden hot spring spot near the ocean, besides trying out a variety of refreshing activities such as forest-bathing in the soothing forest! 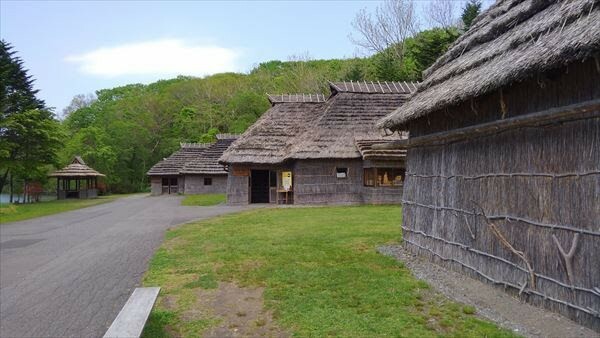 What is Ainu Ethnic Museum “Poroto Kotan”? 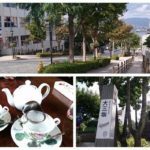 Shiraoi may be blessed with savory seafoods and rich nature, but it is popular mainly because it has “Ainu Ethnic Museum Poroto Kotan” that I am about to introduce. 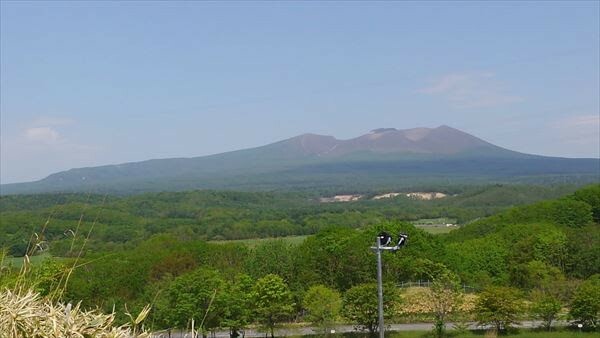 To begin with, Shiroi was a village to the Ainu people, who decided to preserve their tradition especially from the end of the Tokugawa period through the Meiji period, during which time a considerable amount of Japanese population moved to Hokkaido. 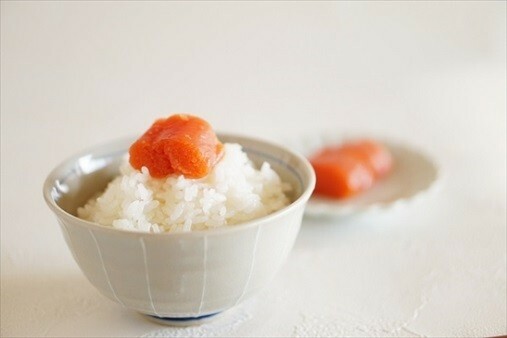 And as part of the effort to preserve the Ainu tradition, Poroto Kotan was made. 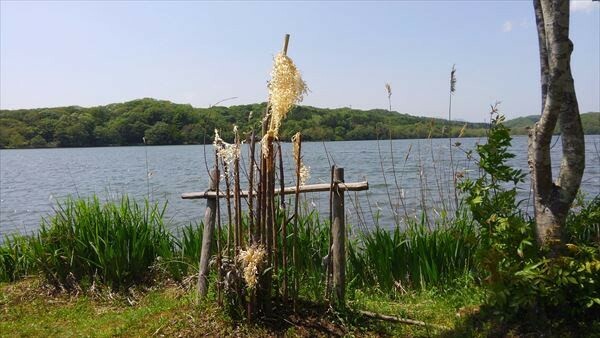 In 1965, the Ainu villages in parts of Shiraoi City were moved near to Poroto Lake, where the people also established a museum in order to conserve and introduce Aino culture. The continued efforts have resulted in promoting the museum to a national museum (“National Ainu Culture Museum (provisional title)” in 2020. 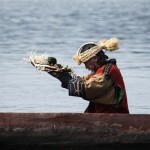 Countries around the world have been paying close attention to the lifestyle in traditional Ainu culture that embraces nature, while numerous artists have been inspired by the unique artworks and crafts of the Ainu people. Poroto Kotan is located around a 13 minute walk from JR Shiraoi Station, but since trains are quite scarce, it is recommended to drive there. 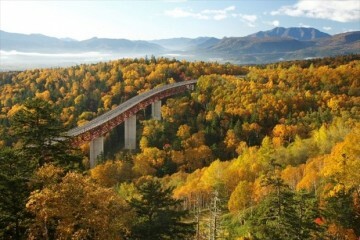 Using the Hokkaido Expressway, it takes about 1 hour from Sapporo, and 30 minutes from New Chitose Airport. When driving to Poroto Kotan, I recommend stopping by at Tarumae SA to take a rest. This is an outlook with a view of Mt. Tarumae, which is an active volcano with a unique shape that resembles a pudding served on a plate. 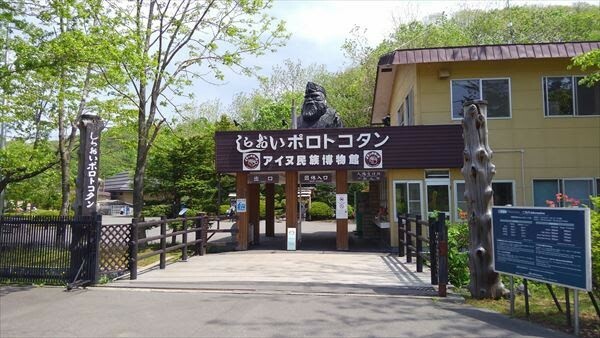 When approaching the gate of Poroto Kotan, you will see the upper body of “Kotan Korokuru statue”, which is readily depicted on tourist guide books, etc. Pay at the gate to go in, and you will find the statue standing rather tall! No wonder it’s so tall! 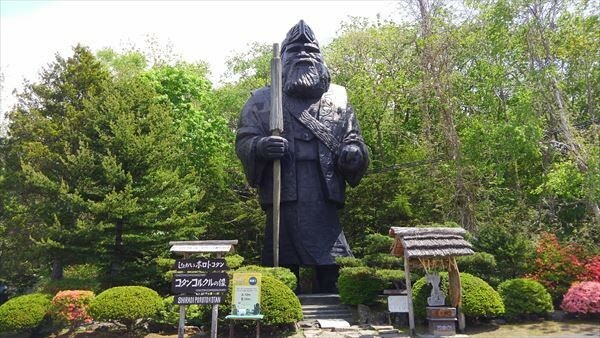 The height of the Kotan Korokuru statue is 16 meters, which is as tall as Nara’s colossal buddha statue. 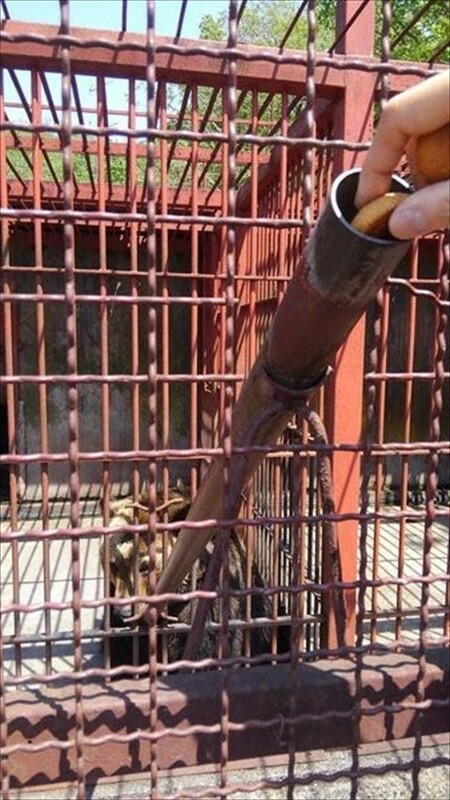 As you walk a little from the statue of Kotan Korokuru, you will find cages with Hokkaido dogs and bears! 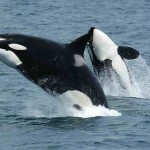 And since they are used to seeing people, you will notice that they are all nice and relaxed. Although I heard I would be able to find the pups of “Otou-san (dad)” (the dog that frequently appears on cell phone commercials), they didn’t come out of their little huts all day, so I couldn’t take any pictures of them…my apologies. Meanwhile, you can see the bears quite upclose. I don’t think any other zoo allows its visitors to go up as close! 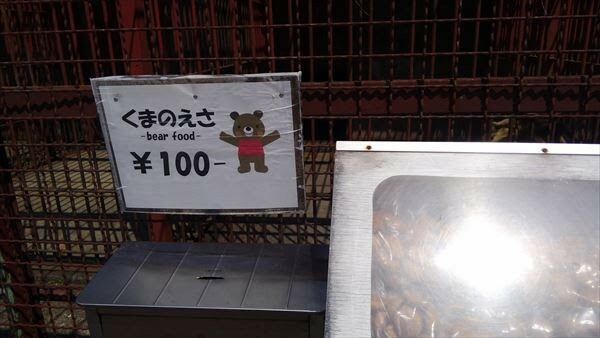 And when I noticed that they were selling bear feed right next to the cage, I just couldn’t resist. It was so adorable to watch the bear stuffing its face with feed, that I had completely forgotten about how ferocious it could be. 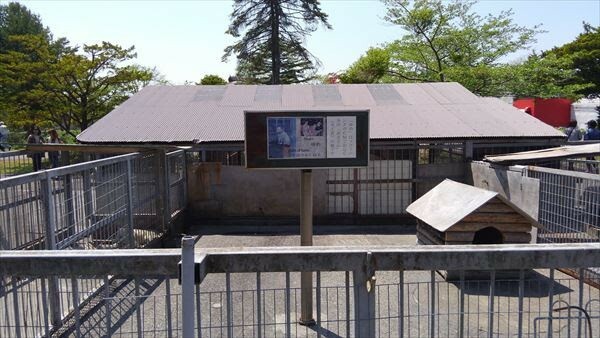 There is a small garden opposite to the bear and dog cages. 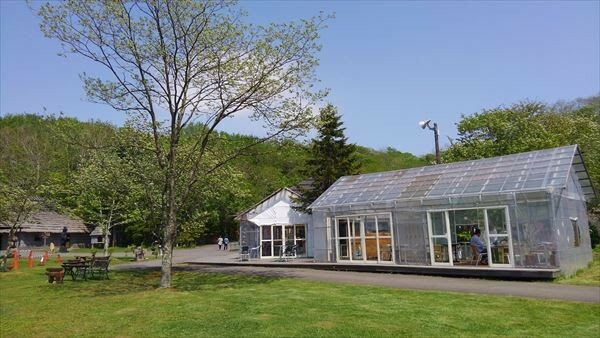 This is Yasouen, which introduces vegetables and plants the Ainu people used as both food and medicine. 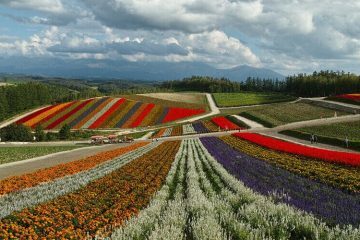 Otompuy-kina. Kusarino-ou in Japanese. 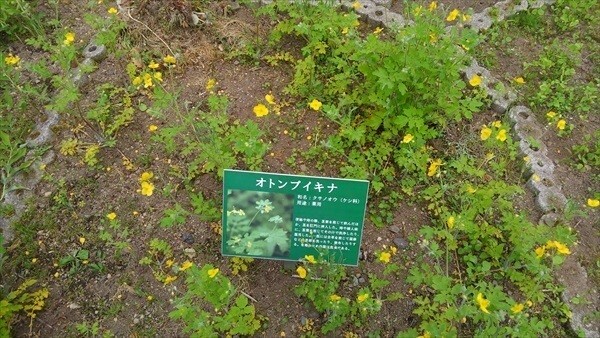 It’s a medicinal herb in the poppy family. Pukusa. Gyoujya Ninniku in Japanese. Also commonly referred to as Ainu leeks. 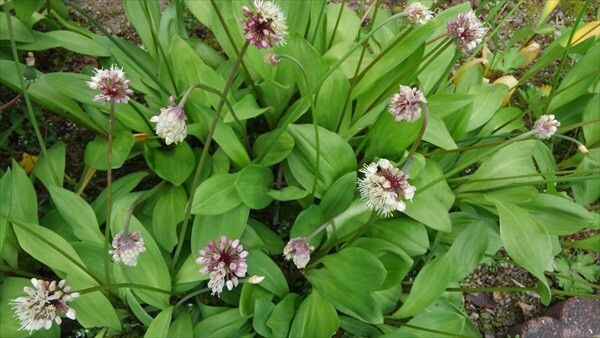 It’s one of Hokkaido’s most common wild vegetables. Yukizasa, of the lily family. It’s edible. 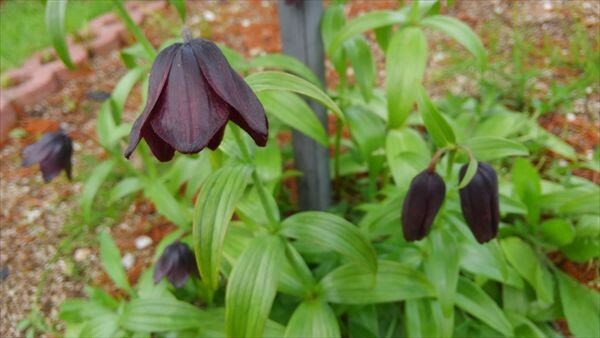 And the one plant I just have to highlight is this black lily. 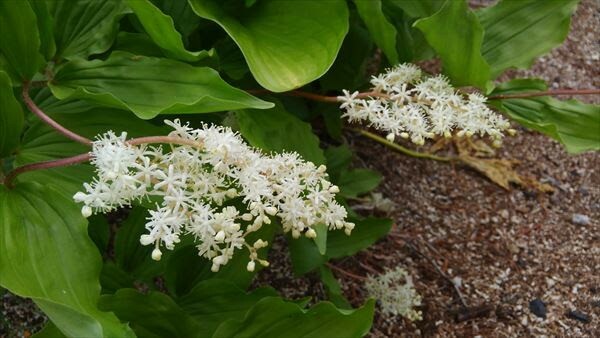 It is a remarkably rare flower that is uncommon even in Hokkaido. I felt so lucky to have seen one myself! 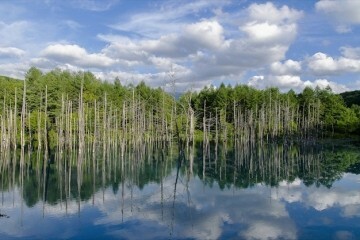 As I went even further in, I was able to find five traditional Ainu folk homes (Chise) in the center of the site. Meanwhile a traditional Ainu dance performance was about to be held in one of the upfront houses (or saun-chise in Ainu), so I went in. 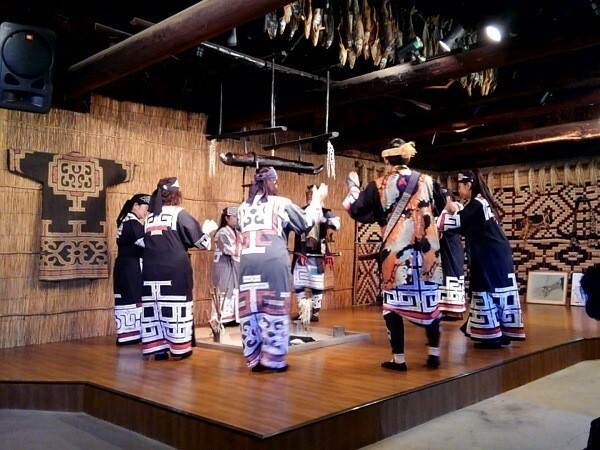 The performance began, and we were shown several ancient Ainu dances which were narrated by the staff. We were able to see some bold and masculine moves from the male staff, and listen to round songs and lullabies sung by the female staff. I felt the simple beats resonate deep inside my heart. 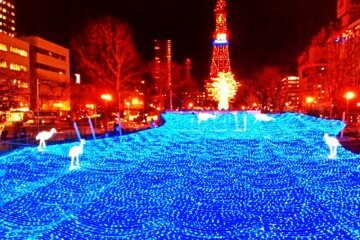 It was a special performance with a mysterious charm to it. Finally, I entered the Ainu Museum Poroto Kotan. The drawings that fill up the wall illustrate the Ainu’s view of the world, and their lifestyle with many more additional material. There was also an animated work that was narrated by an old Ainu lady, which added to my perception of the mysteries of the Ainu people. There is a shop inside the museum that sells a wide range of products including books and written material regarding Ainu culture, as well as fabric and wooden products that feature unique traditional Ainu patterns. 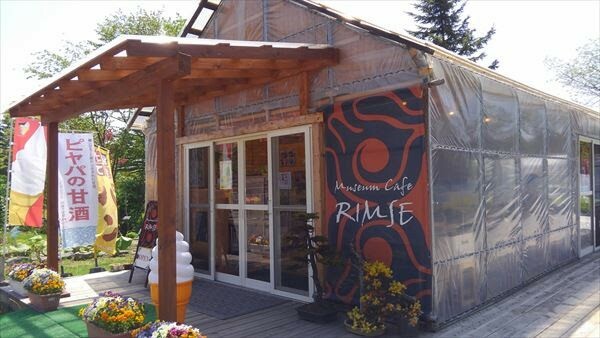 The last destination is the cafe with a museum: “Cafe Rimse”. 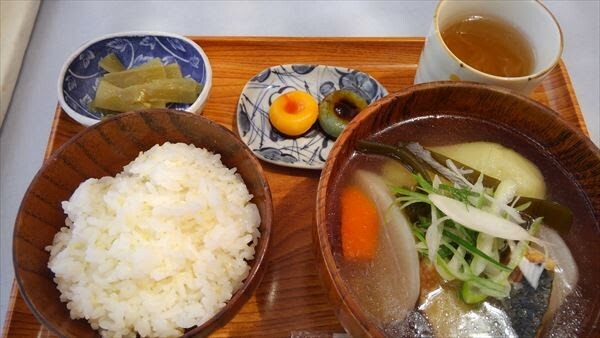 “Ohau” refers to soup, and it is said to be the origin for Hokkaido’s local food, “Sanpei-jiru (soup with rice bran or pickled vegetables)”. This salt-based soup contains salmon, potatoes, carrots, etc. Even though the ingredients are mostly the same with Sanpei-jiru, Ohau has a more simple and refreshing flavor that better highlights the original flavors of each ingredient. “Niseu” means acorn, and so the noodles are made with acorn flour. Although I was served plenty of times at several Ainu restaurants, I just had to try this rare and unique dish! The udon noodles were quite firm and had a satisfyingly chewy texture to them. 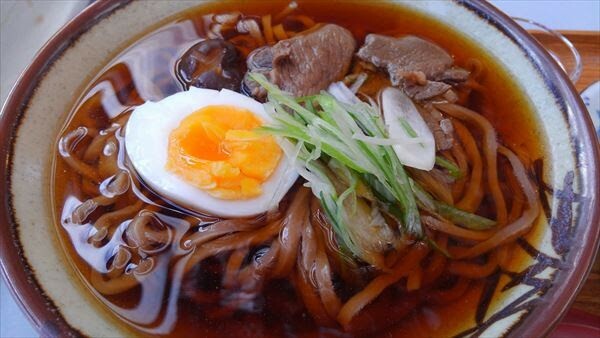 The shiitake mushrooms were all locally-produced, while the meat used was Hokkaido sika deer meat. The udon had a clean and refreshing taste, as well. 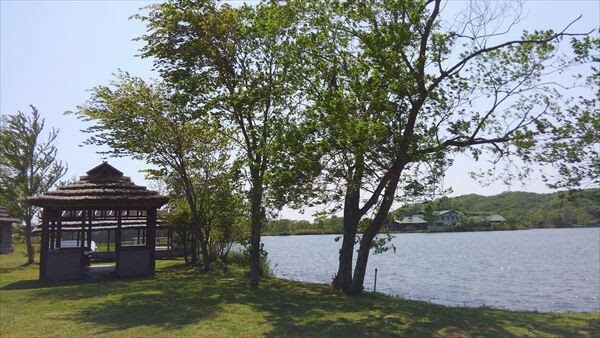 After enjoying delicious Ainu cuisine, I spent a relaxing time overlooking the Poroto Lake while feeling the pleasant Hokkaido breeze. Lectures, performances, crafting workshops, and more exciting events take place in Poroto Kotan on a regular basis. 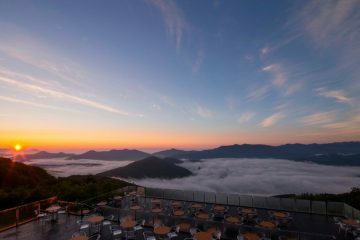 One of the especially important events is the annual summer event called, “Poroto Kotan no Yoru (night at Poroto Kotan)”, in which visitors can experience Ainu culture to the fullest. 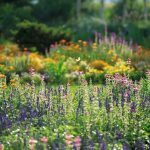 I highly recommend visiting that event! 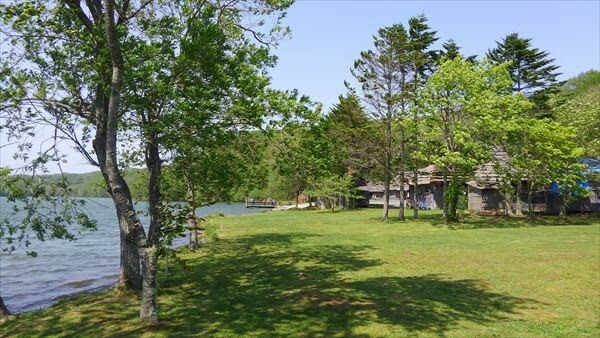 I also look forward to the launching of the national Ainu Culture Museum near Poroto Lake, which is scheduled to open in 2020!